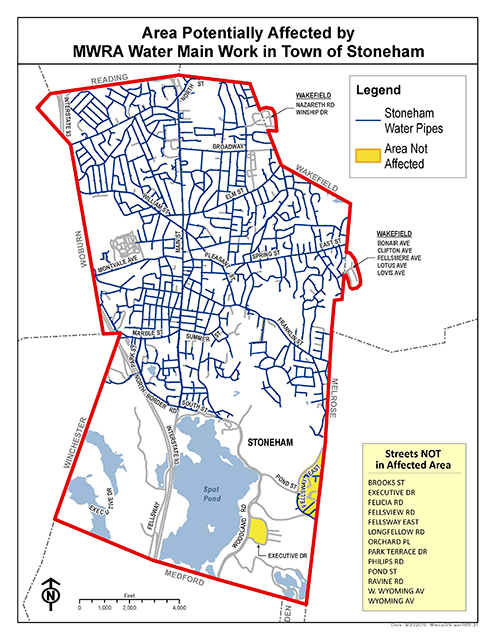 The Massachusetts Water Resources Authority along with the Town of Stoneham will be conducting a meter isolation trial and fire flow testing. The work is scheduled for TUESDAY, APRIL 16, 2019, STARTING AT APPROXIMATELY 9:00 A.M. The water services to homes will not be interrupted; however, there is a possibility that the fluctuations in water flow within this service zone may cause discolored water. See map (PDF) for more information. If discolored water does occur, please do not do laundry at this time, as it could stain light colored clothing. Residents should wait for the water to clear before using it. After the activation has been completed, you may want to run your COLD WATER ONLY at the kitchen faucet or outside spigot until the water clears. The work involved with this exercise is all part of the MWRA’s Northern Intermediate High project designed and built to provide redundancy to the communities of Reading, Stoneham, Wakefield, and Woburn. If you have any questions or concerns, please contact MWRA Community Relations Manager, Jeffrey McLaughlin at (617) 305-5762 or jeffrey.mclaughlin@mwra.com.